Elisabeth Sladen passed away on Tuesday morning, aged 63. She'd been battling cancer for some time, although as an intensely private person, it doesn't seem that anyone but her immediate family knew she was ill. Lis played the character of Sarah Jane Smith on the long-running sci-fi program Doctor Who (and would later return to the new Who series as well-- her reappearance on the show was so popular that it resulted in her own spin-off series, The Sarah Jane Adventures). For many of us, Sarah Jane was OUR companion. THE companion. She was someone you instantly liked, wanted to root for and become friends with. As viewers we could relate to her, and we saw things through her eyes. She was one of the reasons I took to the series after my husband (who grew up with the show) introduced me to it after we met. In many ways, I suppose, when I think about our early relationship, the Doctor and Sarah will always be linked in there. I remember when I went to New Zealand to visit him and meet his family for the first time, we watched 'The Ark in Space', a 4th Doctor and Sarah adventure. I will always remember that. It wasn't long before I was drawn into the Sarah Jane era of the program, which just about everyone considers to be Doctor Who's Golden Age. There is a reason for that. And much of it has to do with Sarah Jane Smith, plucky, independent journalist, who meets the Doctor, falls into joining him on his adventures and quickly becomes his "best friend." Last year, Rod and I decided that we would rewatch the entire classic Who series, starting with William Hartnell in 1963 and working our way through to Sylvester McCoy and the end of the show in 1989. We just finished 'The Time Warrior' on Sunday night, Sarah Jane's very first story. We have been through 10 years' worth of episodes, three Doctors and 13 companions (many of whom I have enjoyed), and then here comes Sarah Jane, and she is such a huge breath of fresh air. She is a light. A refreshing, plucky light of a person who isn't afraid to tell anyone what she thinks (no matter what time period she may be in). This time round I was immediately struck by how well she played off of Jon Pertwee's 3rd Doctor, and it made me even more excited to get to Tom Baker's era because her chemistry with him is magic. MAGIC. When the new Doctor Who series started and reinvented itself into something I wasn't taken with, it was still cool to see that Sarah Jane was still Sarah Jane. Elisabeth Sladen still played her as the same person. That same plucky, likeable character you wanted to root for. It was as if she hadn't aged a bit. And so it was devastating to fans to hear that she had passed away, and so suddenly. I was absolutely gutted and didn't want to believe it, even as more and more sources began confirming it. I had always wanted to meet her one day, but now I will never get that chance. 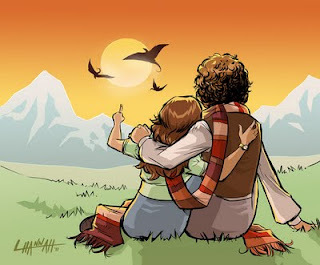 And now there are tribute pages and tribute art, stories from people who knew her, and even a link on the Sarah Jane Adventures website to help parents in comforting their children about Lis Sladen's passing. I love so, SO much that she had this resurgence of popularity late in her career, and that the character of Sarah Jane Smith could be introduced to new fans, and to children. How wonderful. I cannot imagine how devastating Lis' passing must be to her friends and family. My heart aches for them. She left behind such a wonderful legacy. There are many pieces of tribute art popping up online. And, after taking some time to process things and deal in my own way, I decided that I didn't want to do something sad. Sarah and the Doctor had a special relationship, and neither wanted to part. Sarah was there with the Doctor through it all because she wanted to be. I loved that when she did leave, it was out of necessity and was forced upon them, rather than having her written out of character and marrying someone she'd just met, or deciding she'd had enough of traveling. Doctor Who companions come and go, but Sarah Jane was special. And so was Lis Sladen. So, I decided to draw a picture of one of the happier adventures the Doctor and Sarah may have had. Not sad, but looking to the future. Because Sarah Jane Smith will always live on. A wonderful story and a wonderful image. Thanks for the post. Your image and your post really moved me and helped me to deal with her loss. I'm new to Doctor Who fandom in general (old and new) but Sarah Jane Smith is a name even those new to the series have heard before. Thank you for the post and the image. Beautiful image - thanks, Leanne. Leanne, thanks for this lovely uplifting view and story at a very sad time. Lis Sladen was dearly loved in the Whoniverse, and the depth of her loss is just beginning to sink in. Adorable image that I will treasure. It truly eases the pain. Thank you again. A beautiful illustration, Leanne...and a very moving tribute. I am a friend of John Leeson (K9), and I can assure you that Lis Sladen's passing has left him, as well as other people close to her, quite bereft.